Striking a bicyclist or pedestrian while driving a car can be one of the most horrifying experiences for everyone involved. If you are involved in a car accident with a pedestrian or a bicyclist, there are a number of things you need to keep in mind so that you don’t make it worse. Understand that even if there is no visible injury on the person you hit, you could be exposed to both criminal charges (the state may prosecute you) as well as civil liability (the injured person could sue you). 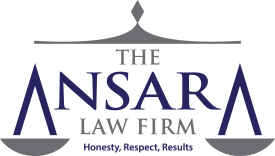 The Ansara Law Firm’s Fort Lauderdale Criminal Defense Lawyers know that Florida consistently ranks as one of the highest states in the U.S. for both bicycle accidents and pedestrian accidents. In fact, Florida’s pedestrian fatality rates are nearly double the national average and our bicycle fatality rates are triple the national average, according to the Florida Department of Transportation ( DOT). While Florida accounts for six percent of the U.S. population, we have 11 percent of all pedestrian deaths nationally and 17.5 percent of all bicycle deaths. Miami-Dade and Broward Counties are No. 1 and No. 2 in the state for the highest number of pedestrian and bicyclist injuries and deaths. Part of the reason these accidents are so serious is because pedestrians and bicyclists are, “vulnerable road users.” That is, they lack the protection of a vehicle in a crash. That’s why the number of emergency room visits, hospitalizations and deaths involving these groups is so much higher percentage-wise than for motor vehicle occupants. A pedestrian is any person who is traveling on or near the roadway on foot. This includes persons in wheelchairs or on roller skates. A bicyclist is anyone traveling on or near the roadway on a non-motorized, wheeled apparatus. Are Their Rights/ Responsibilities the Same? Bicyclists are legally considered “vehicles,” while pedestrians are not. F.S. 316.130 states that where sidewalks are provided, a pedestrians should not walk on the road, but must instead walk on the sidewalk. Where sidewalks aren’t provided, a pedestrian can walk on the road, but only on the left side shoulder, as related to the direction in which the pedestrian is walking, facing oncoming traffic. The thinking goes that if a driver and pedestrian are facing the same direction, they are more aware of each other’s presence and thus the likelihood of an accident is reduced. Pedestrians have the right-of-way at marked crosswalks. However, pedestrians crossing the road at any other point than within a marked crosswalk has to yield the right-of-way to all vehicles, meaning they have to stop, look left, look right and then look left again before proceeding. Pedestrians have to obey all traffic signals and can only cross a road when the pedestrian light indicates it is safe to do so. It’s against the law for pedestrians to stand on a paved road to solicit a ride, work or business from any vehicle occupant. When it’s reasonably necessary to avoid a condition or potential conflict. Bikes riding at night need to have a white light on the front of their bike and a red light on the back to remain visible. You Hit a Bicyclist/ Pedestrian. Now What? Again, you must understand as the driver of a motor vehicle, you will be carefully scrutinized by law enforcement. As far as potential criminal charges, it will depend not only on what exactly happened, but also how badly hurt the pedestrian or bicyclist is. There is no such charge as, “hitting a bicyclist” or “hitting a pedestrian.” Instead, law enforcement officials will ascertain whether you have violated any laws that led to the crash. That means that if the bicyclist or pedestrian is deemed at-fault in the accident, then no matter how injured that person is, you cannot be charged with a crime. However, if you run a red light and kill a pedestrian, you could potentially be charged with vehicular homicide. But if you run a red light and hit a pedestrian but no one was seriously hurt, you may only be cited for violation of F.S. 316.075. If you fail to remain at the scene, you can make the situation much, much worse. F.S. 316.027 identifies bicyclists and pedestrians as “vulnerable road users” and indicates that in crashes involving injury or death, you MUST immediately stop at the scene or as close to it as possible and remain until you have fulfilled your obligations under F.S. 316.062. Failure to do so, even if you were NOT at-fault, could mean felony charges. Provide aid to the pedestrian/ bicyclist. That means getting out of your vehicle (if you can do so safely) and checking for injuries. Offer CPR or any other kind of aid you know how to give, if it’s necessary. Call 911. If no one is seriously injured, you still need to call police. You should do this even if the pedestrian or bicyclist walks off and refuses an exchange of information. You need to do this because you don’t want to later be accused of a hit-and-run. Don’t throw away or hide evidence. Cooperate/ be polite to law enforcement officers and emergency responders. Your actions at the scene could dictate your credibility. That doesn’t mean you have to answer any and all questions, but be courteous and respectful. Take photographs. If it’s safe to do so, take pictures of the accident, surrounding areas, injuries, etc. Don’t discuss the accident with anyone. That includes on social media. Don’t apologize to the other party, because that could be seen as evidence of fault. Lastly, contact an attorney. Generally, for any civil liability claims for which you are accused of fault, you will be represented by an attorney provided/ paid for by your insurance company. However, this individual usually will not also represent you in any criminal actions, so it’s imperative to contact a criminal defense lawyer right away if you are facing any criminal charges related to a bicycle or pedestrian accident.